Ever fancied yourself as Roger Moore in the The Man With The Golden Gun? 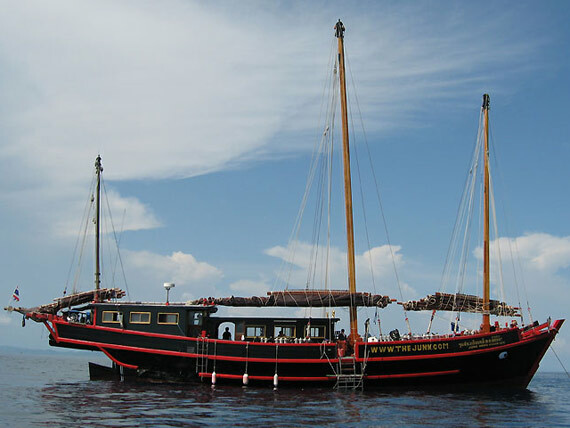 Well, now you too can sail the Thai coast in a junk. Popular dive operator blue o two is offering diving holidays aboard a stunning junk called, er, S/Y The Junk – in collaboration with Worldwide Dive and Sail. Thailand includes more than 2,500kms of coastline which plays host to sandy beaches, sheltered bays and idyllic islands. In the southeast of the country are the stunning Similan and Surin islands where diving is truly astounding. The Junk will run new four and six night ‘Similan and Surin Islands’ itineraries, taking in some of Thailand’s incredible underwater spectacles. Several species of shark can be found patrolling the waters of the Similans, manta rays are frequently sighted and whale sharks make an occasional appearance. There are plenty of smaller creatures too and on each dive, divers will discover several types of anemone fish, different species of ghost pipefish and seahorses as well as a fantastic array of molluscs. Originally built in 1962, the 33m long S/Y The Junk underwent a complete overhaul in 1997 to prepare her as a liveaboard diving vessel. She can host up to 18 guests (but typically accommodates 12-14 divers), she has six air-conditioned and ensuite large cabins offering versatility for varying guest requirements. Alongside the decadent interior, S/Y The Junk’s top sun deck offers stunning panoramic views of Thailand. For more info or to book a place aboard S/Y The Junk, contact the blue o two team on +44 (0)1752 480808 or email info@blueotwo.com. Hopefully, there’ll be no midget assassins hiding in suitcases onboard.